Kevin Ensley presses and rolls his ink-stained thumbs onto the back of a six-page form. Within minutes, Oregon State Police scan for any criminal record and electronically approve his application. It’s a Monday afternoon inside a Southeast Portland gun shop. Another firearm has been sold. If there’s a face of gun ownership in America, or Oregon, Ensley could be it. He’s a registered Republican who earns a healthy living. He’s a hunter who got his first gun at age 10, a Christmas present from his parents. Now he’s the proud owner of a $1,400 camouflage shotgun he’ll soon take duck hunting, increasing his firearm collection to about a dozen. Give or take. The Oct. 1 mass shooting at Umpqua Community College again thrust Oregon into the national spotlight over senseless violence, Second Amendment rights and gun control. But the rampage – which left 10 dead, including the shooter, and nine injured – offered little insight into gun ownership in the world’s most gun-saturated country. In Oregon, like in so many places, the picture is complicated. Many Oregonians are comfortable with owning guns, particularly in rural communities outside the Willamette Valley. They own firearms for protection, sport, investment or sentimental reasons. They champion gun ownership as a constitutional right. “Oregon, I’d say, is a gun state. And I don’t mean that in a pejorative sense,” said Ron Louie, Hillsboro’s police chief from 1992 to 2007. There’s no definitive statistic to measure gun ownership. But by several measures, Oregon’s per-capita rankings stand in the middle or toward the bottom in estimated gun ownership, in hunting licenses, in deaths from firearms. Those figures underscore an urban/rural divide. In nine rural Oregon counties, for instance, at least one of every 10 residents is licensed to carry a concealed handgun. Louie recalls leaving California’s Silicon Valley in 1987 for coastal Oregon. One month into his job as chief in Astoria, Louie radioed for backup after spotting a man walking across a bank parking lot with a shotgun under his arm. When officers arrived, Louie felt a tap on his shoulder. In a country of nearly 319 million, Americans own an estimated 310 million firearms – essentially one for every man, woman and child, as President Barack Obama noted hours after the Roseburg shooting. Those guns are concentrated among a shrinking minority. In 2014, about one-third of American households had a gun, down from nearly half in 1973, according to an annual study by the University of Chicago. Who owns guns? Bindu Kalesan, an assistant professor at Boston University’s School of Medicine, and other researchers found out in a 2015 study published by Injury Prevention. It pegged the rate of U.S. gun ownership at 29.1 percent of adults. Among states, Oregon ranked 37th, at 26.6 percent. Researchers asked 4,000 Americans about social factors: Did the person’s social life with family or friends involve a gun? Would their social circle or family think less of them if they didn’t own a gun? Those who answered yes were twice as likely to own guns. “Having friends and family who have a gun, or support guns, or who do things with a gun, that means you’re more likely to be a gun owner,” Kalesan said. Overall declines can be traced to the fading popularity of hunting. In 1977, nearly one in three Americans reported a hunter in the household, according to University of Chicago researchers. Last year, it was fewer than one in six. In Oregon, voluntary membership in the Oregon Hunters Association stands at about 10,000, said Ken McCall, the statewide field director. Over his 65 years, McCall has built a collection of about a dozen firearms, several of them heirlooms. His last hunting trip was a year ago, in Wyoming. Despite a dwindling share of gun owners, America’s firearms business has never been stronger. Domestic manufacturers produced nearly 10.9 million guns in 2013, including weapons obtained by law enforcement agencies but not the U.S. military. That’s double the number from 2010, and triple the number from 2006, according to federal statistics. Brian Bennett, a spokesman for the Seattle field division of the Bureau of Alcohol, Tobacco, Firearms and Explosives, said Obama’s election fueled some of that. He recalls gun owners waiting in front of empty store shelves for ammunition to be stocked. “I think the fear that laws would change when he came into office, people went running,” to buy more guns and ammo, he said. There’s no limit to the number of guns someone can stockpile. Oregonians do face more restrictions since a law took effect Aug. 9 requiring background checks on private sales. Oregon is the 18th state with such a law, said Stacey Radnor, a spokeswoman for Every town for Gun Safety. Applications are generally denied because of a felony conviction within the past 15 years or a violent misdemeanor conviction in the past four years. Those who were committed to the Oregon Health Authority or found mentally ill by a judge are also rejected. Oregon’s new law also allows a judge to temporarily ban guns for people ordered to get outpatient mental-health treatment if they’re deemed a threat to themselves or others. But in the Roseburg shooting, it’s unlikely the changes would have mattered. The shooter had a mild form of autism and had reportedly attempted suicide, but authorities said he obtained his guns legally. Worries about security also play a role in gun ownership. In southern Oregon’s rural Josephine County, the number of deputies has been cut by about two-thirds in the past decade, said Sheriff Dave Daniel. Staffing now stands at nine, with deputies on patrol just 10 hours a day, seven days a week. When they’re not working, it’s up to Oregon State Police to respond. In Murphy, 10 miles south of Grants Pass, Josephine leaders closed one of the sheriff’s substations. After that, Russ Withem moved his gun shop into the building. “I had lots of people buy guns from me, saying they’re buying guns because we don’t have a sheriff’s department,” Withem said. In the wake of last week’s shooting, some Umpqua Community College students are thinking more seriously about firearms, too. Tracy Stepp, 29, was in Snyder Hall when gunfire erupted. Stepp grew up in a military family, a clan of hunters. “I’m a dead-on shot,” she said. Everyone in the family owns guns, she said. Everyone except for her. With three kids – ages 11, 2 and 1 – she doesn’t want a gun around the house until the children get older. But after Umpqua? 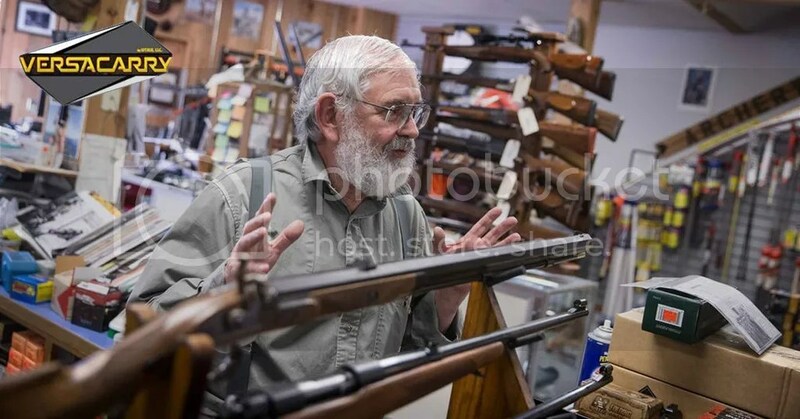 Back at the Gun Room in Southeast Portland, where Ensley buys his shotgun, owner Warren Lacasse, 71, calls the Roseburg shooter a “copycat lunatic.” He suggests that the shooter could have been stopped by someone else on campus with a gun. Nearby, son Shaun Lacasse helps customers. One shopper, with tattoos on his neck and face, questions whether the Sandy Hook shooting that killed 20 children and six adults actually happened. Shaun Lacasse disagrees but then lets it go. Among the racks of rifles and glass cases of handguns, the cheapest firearm runs a couple hundred bucks. “This is artwork,” he says. As he stands behind the counter, near a stuffed turkey shot more than 20 years ago by his son, Lacasse is asked how many guns he owns.